HDBaseT-compatible transmitter capable of transmitting HDMI signals up to 100 meters over an Ethernet cable. 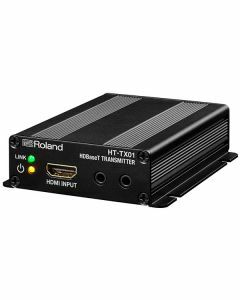 The HT-TX01 can be used as a receiver for the HDBaseT output from XS series multi-format matrix switchers. Using the RS-232C signal transmission function of the XS series lets you transmit RS-232C signals input to the XS series device along with video and audio signals. This can achieve audio/video transmission in school auditoriums, company conference halls, and other large spaces.